We are in the midst of getting ready for vacation! Woooohoooo! We are spending a week camping at Garner State Park with 7 other families. This trip would only be possible because my sister and brother in law are going to live on the farm for a week taking care of things........things that are too many to even list. We are so appreciative of them. "Thank you" doesn't even cut it. I'm also thankful to get to have farmer Jason all to ourselves. I've been beyond busy getting the camper ready, the house packed, and the house cleaned and ready for my sister's family to live here the week. On top of that, I have two weddings when I get back. One of the weddings is the day after we get back. 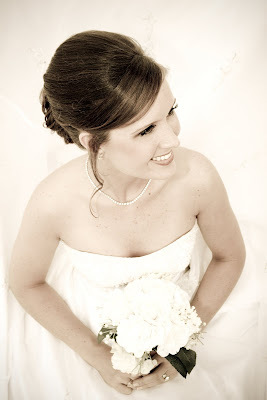 These are my last and final weddings this season in my life- for the next few years anyways. Our family isn't getting any smaller and neither is the farm. The Lord has made it very clear to me that this is something that needs to go right now. I've held it very loosely in my hands from the beginning, so I'm good with that. I know that the Lord will continue to grow and use my gift in other areas of my life. My love and passion for photography will never cease. It is part of me. Besides, I have plenty of photo opps between my family and the farm animals. There is always something to shoot and uniquely capture within my midst. All of this is to say, I've been busy! But, this next week, the plan is to RELAX, float down the Frio River, and have a good time with friends. It is beyond beautiful there. I had no idea a place this beautiful existed in Texas. Jason and I have discovered something weird about us. It is a good weird thing. We are overly nice and giddy to each other while preparing for vacation. It almost sounds as if we are right out of a 50s sitcom or something. "Darling Jason dear. Would you care to load those chairs up in that wonderful RV?" "Sure thing, Lynsey love. You are the twinkle in my eye." This, of course, is an exaggeration, but our conversations are definitely higher pitched and more gushy than normal. I think it is just plain sweet and adds to the wonderful vacation we are about to go on. I thought I'd leave you with some things that I've finished up editing before the trip. 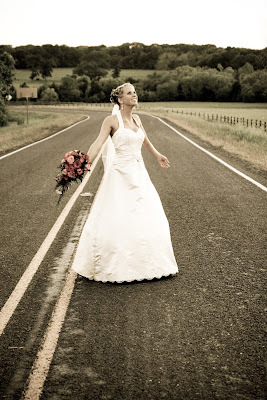 I didn't want to leave my brides hanging while I was gone. Now that these are done and out of the way, on to more packing and getting excited! Meet Melissa. She is a precious country girl. Can you tell? 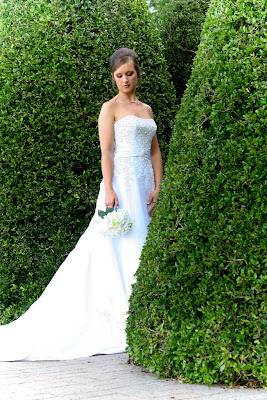 She and I have grown to become friends, as is very typical with most of my brides. 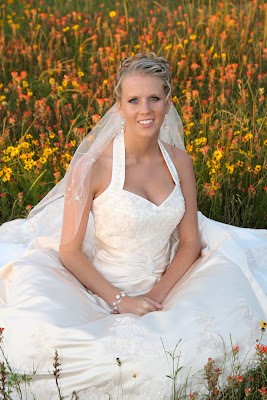 I can't wait for her wedding in Brenham at Lillian Farms. It is sure to be gorgeous. Meet Courtney. She is as sophisticated as she is sweet. 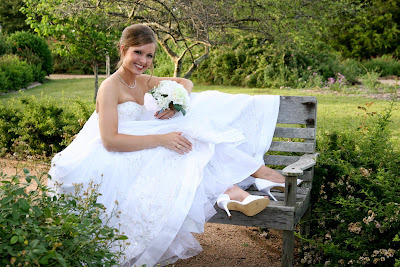 Her wedding is my last and final wedding at La Cantera in San Antonio. 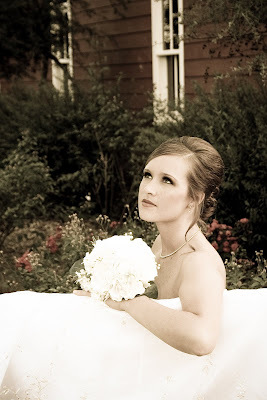 This wedding will be amazing as my last one! This has been an exciting week on the farm. Our pastured pigs are doing excellent. Jason took on the task of putting together this feeder. It was a MAJOR task. This feeder came in a million pieces with hardly any directions. But, since I have a brilliant hubby he more than conquered putting this thing together. He mastered it. The pigs seem to love it. 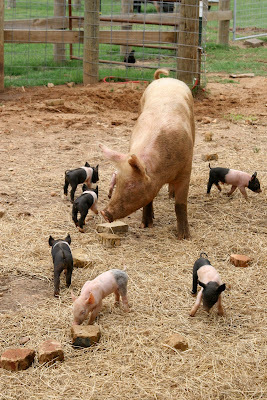 We feed our pigs 100% organic grain that is specifically made for our pigs by Coyote Creek Farm. 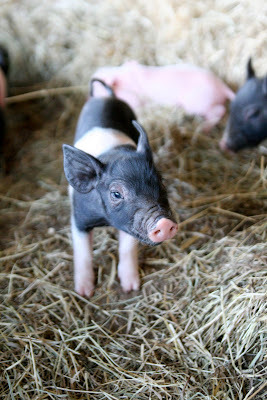 Our pigs are also on pasture at all times free to roam and root on several acres. 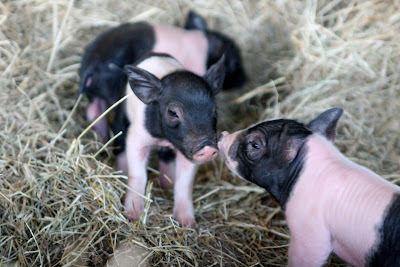 Jason thinks we will have pigs ready to butcher by the end of this summer. 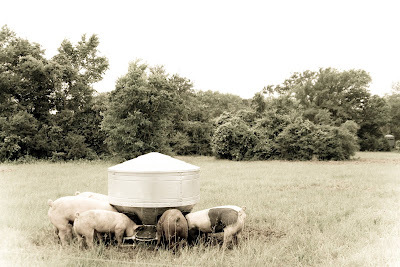 If you are interested in our pastured pork, feel free to leave a comment or e-mail me (kramerswife@hotmail.com) and I will get in touch with you when they are ready. 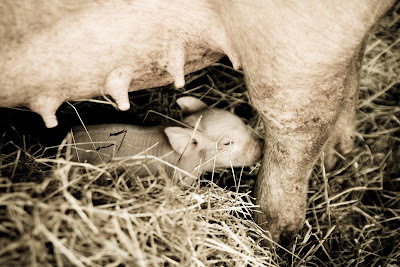 The great thing for us is that there aren't any other farms around who raise pastured pork and finish pigs. Even within the state of Texas the supply is sparse, but the demand is great. We plan on offering bacon, ham steaks, pork chops, pork loin, along with various other cuts of pork. Bring on the bacon! I can't wait to have bacon in our home again! 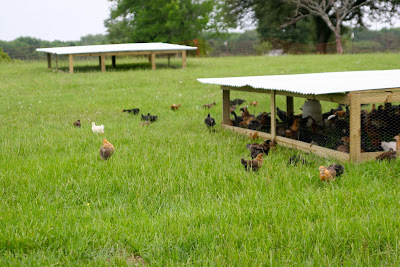 We moved our 300 pullets (female chicks less than one year) out to pasture a few days ago too. Jason and I took on this project as our weekly 'togetherness project'. It was filled with lots of laughs. They outgrew the brooder house and were ready to be on grass. Jason fenced in a paddock with electrified netting and built these nifty houses for them to use as shelter. We are keeping these close to the barn for now in order to protect them from the pesky hawks we have around here. All of these pullets will be our laying hens so our egg supply is about to increase enormously. We are currently selling out of eggs every single week. When these pullets are big enough, the plan is that they will rotate behind our cows in the paddock the cows just finished grazing on and break up the organic matter (a.k.a. poo) and also fertilize the ground with their poo. Chickens are also amazing at eating bugs so this also helps with flies. Our bug population has drastically decreased since we've had chickens on our land. 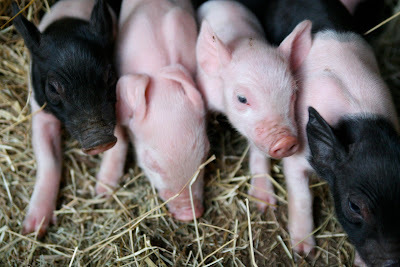 The first litter of pigs are doing great! They are up and moving around with their momma, Lucy. Lucy is an excellent momma. It is so cool to see these little guys grow extremely fast. These are photos of our newest litter that Ethel had. The two runts that I mentioned in the previous post are doing great. I am very optimistic that they are going to make it! The Fern in me is very happy about this. The little runt that injured his leg is getting around good enough to nurse. 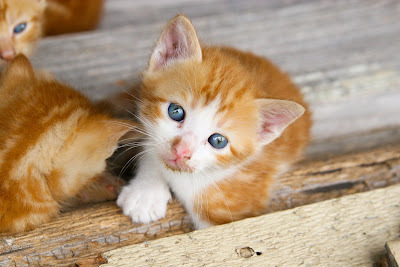 These are the precious kittens that need homes. We have some that are spoken for already, but we have 3 litters to get rid of so there are plenty to go around. We will be heeding Bob Barker's advice in having our pets spayed or neutered. This could quickly get out of hand couldn't it? Things are pretty busy around here, which is the way that we like it. We are getting ready to go from production stage to now getting geared up to start selling our products. I will be posting about some exciting news for our growing farm soon! Stay tuned! 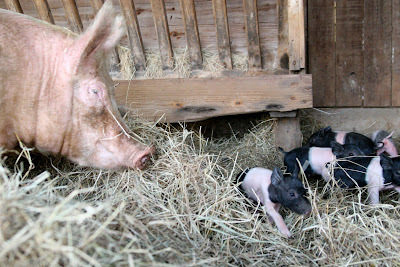 We have yet another batch of piglets. I tell you what. 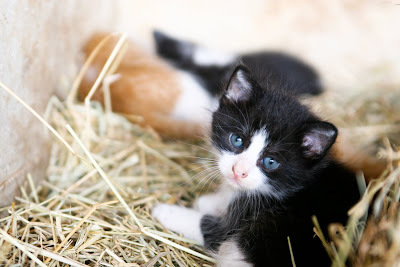 We are a baby having farm. 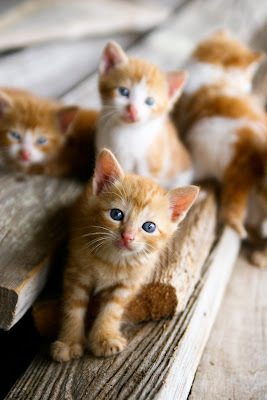 There are tons of new little lives running around here. And some of those new little lives need homes!!! There will be more on that shameless plug tomorrow. But, I felt this photo deserved its own post. 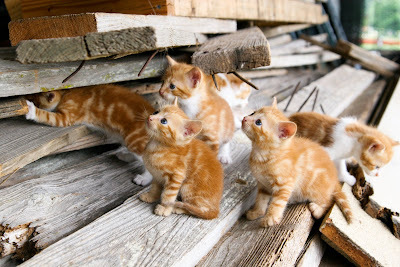 We went out to the barn to check on the animals. 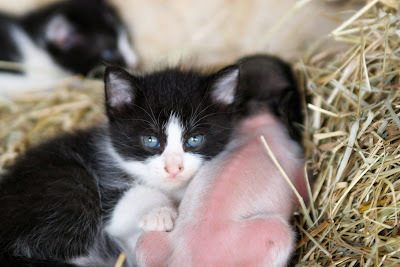 When we walked over to the new batch of piglets, this little guy was found sleeping with one of Dolly's (calico) kittens. He happens to be one of the two runts that Ethel had. He is tiny compared to the rest of them. 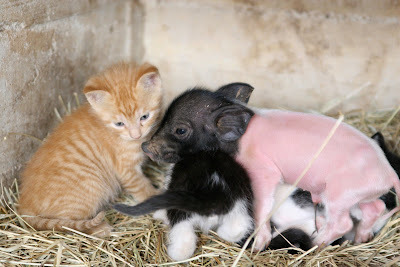 It is obvious that the other piglets know that he is weaker. They pick on him and push him out of the way. 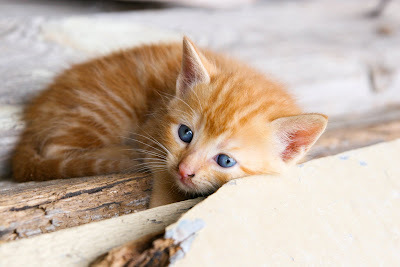 It is taking all of me not to swoop in a rescue him and the other little runt. 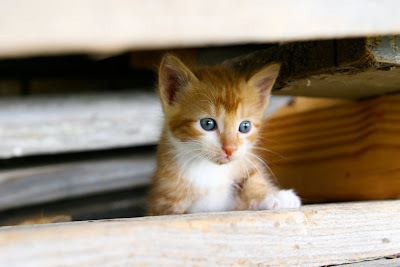 But in order for them to grow stronger, they have to first have the ability to survive. It is just hard for me to watch them struggle. 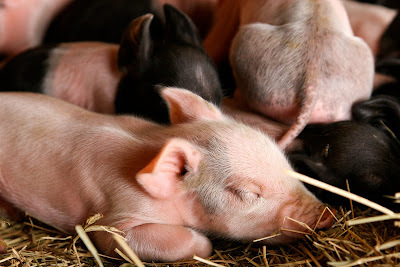 I'm getting all sappy over a piglet so I'll stop. I do think it would be cool to live out Charlotte's Web minus Charlotte, the spider, of course. Jason and I had a Charlotte's Web type of conversation when we witnessed 'Ethel', the momma, stepping on the other runt who Kaylyn has conveniently named 'Wilbur'. I don't know if this little guy will make it. We shall see. The 'Fern' in me caved and had Jason put the little piglet back with its momma. But, let it be known that I will be checking on him regularly. I just wasn't ready to push him around in a stroller, bathe him in my kitchen sink, and bottle-feed him every 2 hours. 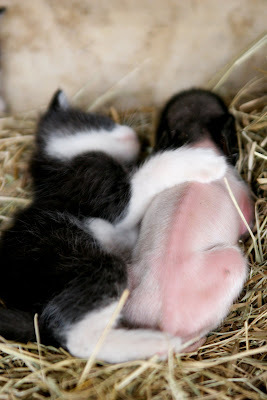 This particular runt in the photos has undoubtedly made friends with the kittens. Farmer Jason is BACK from his April sabbatical! Check it out here. Please forgive me in advance for this confession of sorts. I've been introduced to the wonderful world of MP3 players.....iPods in particular. I know its pathetic. I even own a Mac which makes this even more pathetic because of Macs cool factor. I'm 110% sure I'm not using my computer to the best of its abilities. For the first time ever, I used iTunes yesterday that has been on my computer for, oh, two years. See, this gets even more pathetic. But, the point of his post is not to prove how lame I am. I am intrigued. My incredible hubby blessed me with an iPod nano for Mother's Day. I LOVE it! This is my very first MP3 player. I know, I KNOW! He also blessed me with a substantial iTunes gift card to catch me up to speed. Another confession since I'm getting it all out in the open..........Jason and I DON'T buy CDs ever! I don't even remember the last CD we bought. I love music. Make no mistake about that. Up until I was a married gal, I was extremely musically savvy making my way around the DFW area listening to cool bands. I was also into hip hop during that time too. Don't ask. It was the 90s and perfectly acceptable to go from grunge rock to rump shakin' gettin' jiggy wit it music. I don't miss this life in the least. In fact, I'm rejoicing that I've been delivered from this life and can't even begin to fathom where I'd be if the Lord hadn't rescued me. My husband is so wise when it comes to finances and I appreciate that so much. Did I just say that? I'll say it again. I really am thankful for his financial wisdom and frugality. 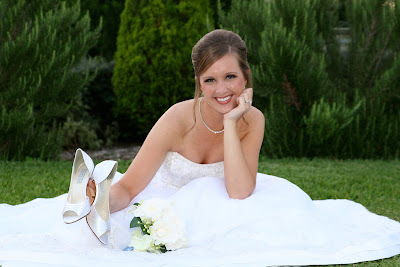 When we were in premarital counseling, the pastor asked us what our hobbies were. I answered the usual camping, MUSIC, antiquing, volleyball, cooking, etc. Not my husband. His answer was simply 'numbers'. Say what? I knew what he meant. 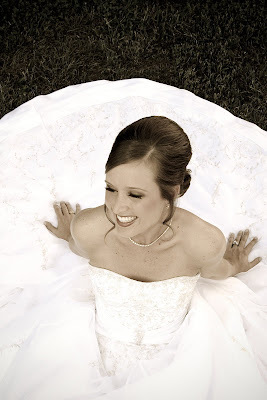 He was very number conscious when we were first wed because we were broke like a joke. Jason's musical philosophy: The radio is free. Why would anyone in their right mind buy a CD when you have a variety of music at your fingertips at all times? But, I do miss having SOMETHING other than the radio. So, what does a girl do when she gets an iPod nano and a gift card? She goes old school because she is scared/uninformed of the new school. Bust A Move- Young M.C. If those songs don't bring a smile to your face, I don't know what will. I giggled as I went through and listened to each one. Oh the memories. Did I also mention that I like to dance......A LOT! I also downloaded some of Hillsong's newest stuff. I love their worship CD (excuse me, album since I'm an iTunes user now) along with some of my all-time favorite worship songs. Then I found a groovy children's worship album for Kaylyn. So we have worship and 90s on the iPod. Seriously. I'm not even kidding. I would like to point out for a brief moment before you go thinking that I'm a heathen, that I didn't choose any songs with explicit lyrics for the sake of little ears possibly listening too- just fun stuff. Well, I think I've done enough damage here in proving how un-cool of a person I am when it comes to anything pertaining to music and gadgets. Even though I said the goal of this post wasn't to prove my lameness, I'm pretty sure that it did just that. The sad thing is that I LOVE music! I really do. And I want to find the 'good stuff'. KSBJ just isn't cutting it for me these days. And I have an 8 GB iPod to fill up with 99 cent songs. I love music about Jesus. That is my bread & water. I have this playing all day long in my home- KSBJ style of course. I also love random music- cool beats, groovy lyrics, easy listening, rock (is it still called rock? ), sisters singing their tail ends off, country (since we live on a farm), etc. Is that random enough for you? I told you, I love music. Here is where you come alongside and help a sister out. I want to know what is on your MP3s besides all of the AMAZING songs from the 90s that I've mentioned? 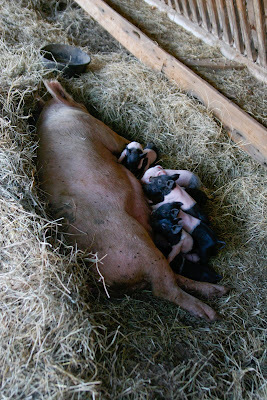 I know it is a bit late in the day, but we've had an exciting mother's day out here on the farm. 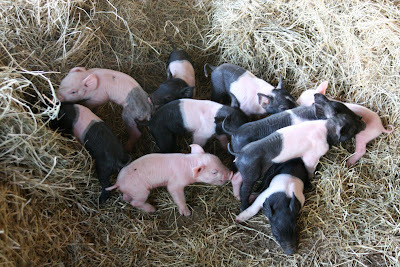 We have 10 PIGLETS! This is our first litter of pigs. Lucy is a mama. 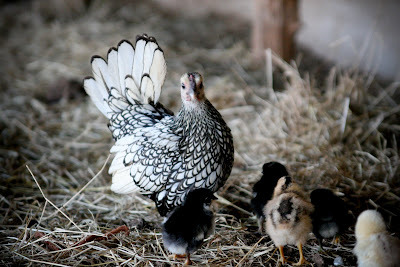 She started delivering yesterday evening while I was out collecting eggs and continued into the wee hours of the morning. My sister, brother-in-law, and niece, Ava, spent the night with us and were here to witness this too! 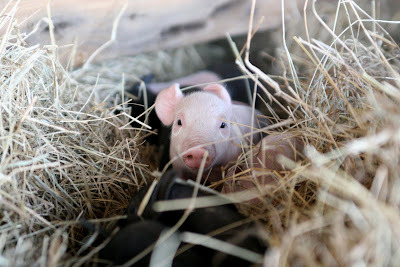 We were up until 1:00 a.m. chatting and checking on piglet status. How fun! Farmer Jason missed it all. Poor guy! I feel so bad when stuff like this happens. He has been looking forward for this day for weeks now. Dang! Farm drama likes to creep its head up when he is not around. I think they know that the less than adequate farmer (myself!) is filling in. We also had another small batch of chicks hatch. This hen is beautiful! Seriously, this was an exciting mother's day! 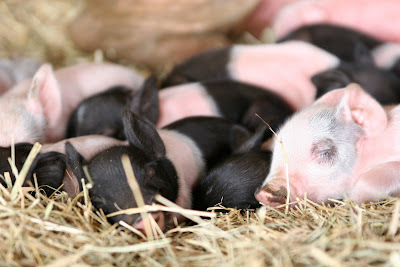 I not only received an iPod nano, I now have a whole litter of piglets. They are the cutest! I was sure that pygmy goats were the cutest baby animals, but I might have to rethink that statement. Laney Rae took 6 consecutive steps today. Any day now she will be walking. No exclamation point here. Sure, I'm excited for her. But, that means my baby will be vertical. And once they go vertical, its a fast and furious race. I have nothing profound to say- not that I ever do anyways. I'm a simple gal. 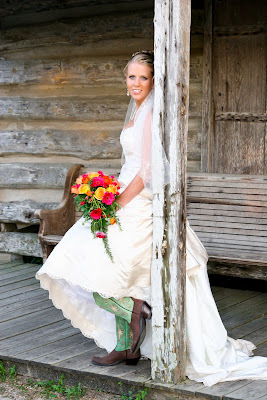 I love being a farmer's wife! I love being a mommy to two amazing girls! 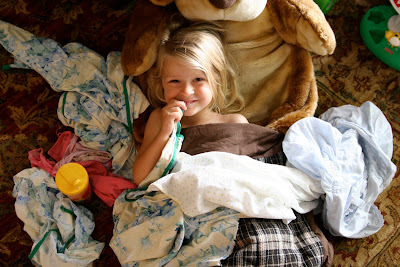 when Kaylyn was a BLANKIE FANATIC! This is a very LONG story of blankies. It involves many people, many types of fabric, and many different colors. First of all, don't judge us. We've taken to heart the wise parenting advice of "choose your battles wisely." Kaylyn's obsession with blankies all started the moment she was born into this world. Her aunt, Honey (a.k.a. Heather Hendrick), made her the original blanket out of some cute old fabric that she had laying around for one of my shower gifts pre-Kaylyn. These blankets were perfect for me to use for nursing Kaylyn. They were bigger than most blankets out there so I didn't feel like I was going to flash the entire world when I nursed in public. I even tied two ends in a knot together around my neck for added coverage and yanking protection. My friends lovingly called it my "nursing cape". They were lightweight and soft so I didn't feel like I was suffocating my nursing child. And they were great newborn swaddling blankets until they discover how to get out of them. I highly recommend THESE once they can wiggle their way out of a normal blanket which is about the age of a few months. We took the original blankie everywhere with us because I nursed every two hours in the beginning. And since KK wasn't a fantastic sleeper, she needed the extra 'help' of swaddling to keep her comfortable and cozy. Needless to say, it is obvious that her love for the blankie developed early on, because they were with us all of the time. 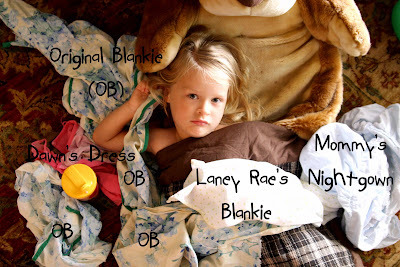 Notice that I've been saying 'original blankie'- singular. Not only was their just one blankie, the fabric used was no longer made at that point. Another dear friend of ours had a baby girl at the same time, who received the same blanket from Heather- the girl can hand make some gifts! Our friend noticed that Kaylyn had grown to love this blankie. Realizing the day was coming that the blankie was nowhere to be found, dirty, or left at some one's house, she sacrificially gave us their replica of this blanket. Hallelujah! This spared us from many moments of shear panic. Our blankie collection grew from one to two blankies. My plan was to keep one folded away and ready at all times. But, Kaylyn found this one and thought it was fantastic that she had two of the same blankies. She was newly walking at this time so she was getting around and into everything! To spare you from every single detail, here are the 'blanket Cliff's Notes'. The two 'OBs' grew from two to three one night in an attempt to discipline KK. I'll spare you the details and me having to relive that night. It was bad and one of the blankies became an innocent victim. Overtime, the other untouched OB wore down from hours spent in the washing machine, HEB, church, bed, barn, swimming pool, etc. Eventually that blankie split in two- by itself without assistance. A precious little girl came into our lives a few years ago. We fell in love with her. She was at our house at least twice a week and sometimes spent the night. Kaylyn still talks about her to this day every single day. But, she is not around anymore and has moved away. She left behind a pink nightgown that Kaylyn sleeps with every single night. She loves it and misses that precious girl. We all do. This brings our total to 4 OBs, plus one "Dawn's Dress". Within the passed few months, she has fallen in love with one of my nightgowns. Good thing I wasn't attached to it because it has been in the bed with her ever since. I had to put my foot down when she wanted to bring this into HEB with us last week. I am not having that! If you ask her why she likes mommy's nightgown she will say because it smells like me and its soft. I think that is just plain sweet. I have a huge recollection of smells so I understand this one completely. I can still recall the smell of my parent's sheets that I used to climb into during a thunderstorm or bad dream. And when I'm visiting my parents and get the privilege of taking a nap in their bed (because they are awesome and watch my kids), I can remember the comfort those sheets brought to me as a child. Of course they are different sheets now- newer sheets. But, their smell is still there. This brings our total to 4 OBs, plus one of "Dawn's Dress", plus one of mommy's nightgown. The last addition is just random. She decided she liked that one a few days ago. But, it won't stick. I know it won't because it doesn't meet her criteria. This brings our total to 4 OBs, plus one of "Dawn's Dress", plus one of mommy's nightgown, plus one randomness. See diagram in the first photo for a visual. Kaylyn walked out of her room with all of these in her arms this morning. She made her way to her sleeping bag and buried herself in the midst of all of her blankies. I thought it was a sight to behold and remember forever so I snapped a few. 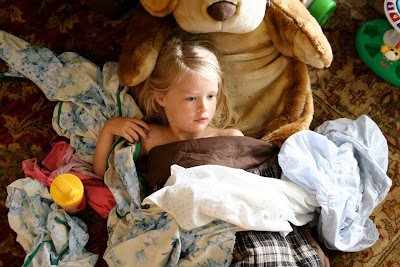 I even snagged a non-staged photo of what she does on a regular basis with the original blankies. If you know Kaylyn, you will understand this photo. She rubs the edging of the blankie along her lips and fingers. It is what make these blankies her favorite......the edge of them. You might think we are crazy parents. I don't care. She loves her blankies and I don't have a problem with that. They don't control our lives- anymore. They stay mostly in her bed. But, she is allowed to take one of the OBs with us in the car. She used to carry one of them around with her at all times, but not anymore. She grew out of that phase. Thank God! As long as they are there when we tuck her in the bed for her nap and at night she is good. I know she won't carry them to high school with her, so why even bother worrying with it. We might have to make a fashionable scarf or belt out of them.They are a source of comfort for her when she is sleeping because they've been there with her from the beginning. One day she will look back on this and laugh. We all will. And I will miss my little girl waking up in the mornings greeting me with an arm full of blankies. I wanted to remember this morning. A few days ago our oldest daughter, Kaylyn, came up to me with these 'onion flowers' in her hand that she had picked from our garden. 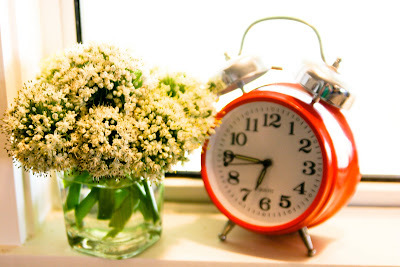 They were accompanied by the sweetest phrase that has came from her mouth to date. "Mommy," Kaylyn said holding the flowers behind her back. "Yes, baby. What is it?" I said. "I need to tell you a what," she continued. "What?" I said back to her knowing where she was headed with this. "I love you. 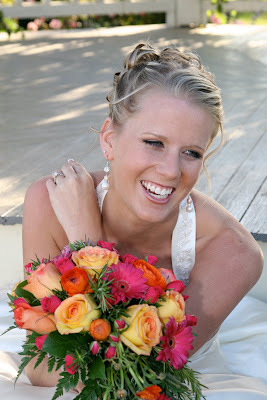 That's my what," she said as Kaylyn unveiled the flowers from behind her back and placed them in my hands. This phrase made my heart sing. I love when children innocently mix up phrases and words. There is nothing like it. But, to hear your child tell you that they love you all by themselves is priceless.